Recently the Little Women found Jonathan’s old space Legos. Annika and Clara wanted to build something “by-the-book” (or booklet, actually), but Nicolyn wanted to create something completely original. Our readers can decide if she succeeded: according to Nicolyn, her creation drives, flies, goes up hills, and collects garbage. Occasionally a reader asks about the chariot that the Little Women allowed themselves to be carted around in during their time in Switzerland. Their vehicle was a Toyota Avensis Verso, which was never available in the United States, but could be described as a “mini-minivan.” Three rows of seats allowed it to hold seven passengers, or the Little Women, their parents, and lots of luggage. Since the Avensis Verso is smaller than a regular minivan, it was a little easier to handle on narrow European streets, and it didn’t guzzle the $8/gallon gasoline as quickly. So Jenelle and Jonathan survived another year with Clara and Nicolyn. The birthday girls each took rainbow cupcakes to their respective pre-school classes, which Jenelle made the night before. Jenelle managed to find some radioactive-pink frosting to top them with. The cupcakes were really just a dry run for the Peeps Rainbow Cakes that Jenelle made the next day. Of course, Clara and Nicolyn each had their own ideas about what a Peeps Rainbow Cake should look like, and so each five-year-old needed her own cake. 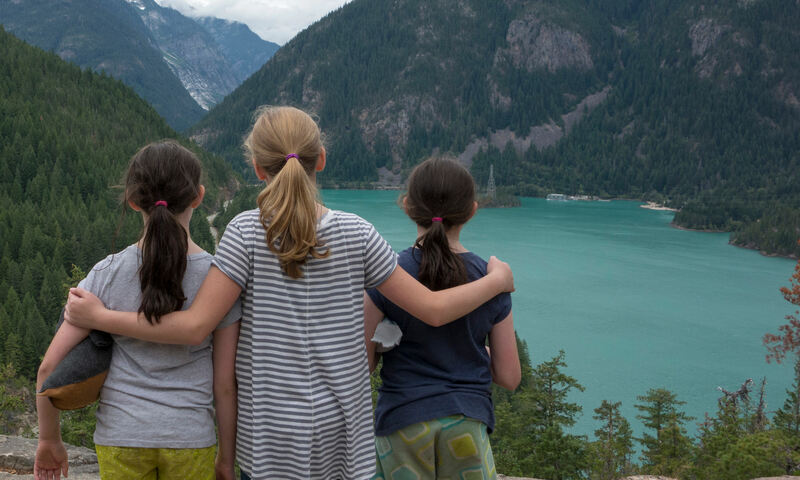 After three-and-a-half years in Switzerland, the Little Women are excited to return to the United States. They are looking forward to getting settled in the Seattle area. The Little Women and their parents are grateful for the good experiences that they had in Switzerland and for the many good people they met there. The Little Women spent the last days of February exploring the ancient city of Istanbul. Along with being the largest city in Europe, Istanbul has roots going back to the 7th century BC and was the seat of four empires. This gives Istanbul the feel of a place where you could find artifacts just by digging in your backyard. But instead of digging around in the ancient Turkish soil, the Little Women preferred sampling the local goodies. Although they didn’t like baklava and Turkish delight, açma and doener kebap were tasty. They also saw some great sights: ancient churches-turned-mosques-turned-museums, a beautiful palace, an eerie underground cistern, and more. Many more pictures are here. As part of their continuing efforts to drag the Little Women to Christmas markets all over central Europe, in early December Jenelle and Jonathan took their brood to Alsace, in eastern France. After spending Friday night in a small town, they went to spend Saturday taking in the Christmastime atmosphere at the picturesque village of Riquewihr. On the way to Riquewihr, they drove through another town, which was lucky enough to have wise men with real camels. In Riquewihr, the Little Women found that the Riquewihr Christmas market featured traditional Alsatian delicacies, including the legendary giant bread. Upon seeing the loaves, Nicolyn declared that she would not be able to eat one by herself. It wasn’t easy for the Little Women to wait while Mommy and Daddy did their Christmas shopping, but pretzels, macaron, and a trip to the village playground made it more bearable. Following the roaring successes of the past two years, this fall each of the Little Women participated in the local Trychelumzug at the end of November. Being a first grader, this time Annika got to wear a cow bell around her waist and a white Burdisack cape on her head. Along with the other kindergarten students, Clara and Nicolyn made lanterns that they carried in the parade. Marching through the winter night, schoolchildren from all over the town wound along the worn, cobblestone streets, splitting the darkness with the glow of the lanterns and the din of the cowbells. How does it end? With a Grittibänz and a smile for every child. Back in May, on Whit Monday, to be exact, the Little Women visited some sights in western Switzerland. The first stop was the town of Murten, which was founded in the 12th century. Murten is one of those cities where the German- and French-speaking areas of Switzerland overlap, and about 75% of its residents are German speakers. In Murten the Little Women found long rows of lovely stone houses. The town also has its old city walls with fortifications. The area beneath the walls is now filled with garden plots for the town’s residents. And though the walls no longer defend the city, they are still available for little girls to run along. Although Switzerland does not have as many castles and palaces as some of its neighbors, the Little Women were able to visit Castle Chillon after leaving Murten. Chillon is a medieval castle on the eastern shores of Lake Geneva. Since the castle has never been successfully attacked, it has a large collection of rooms, towers, and other things, include a dungeon where the poet Byron carved his name on a pillar. You can’t carve your name on the castle anymore, but the Little Women did get to see something there that was even better than a dungeon: in the corner of one of the rooms, a bird family had built its nest, and the mother bird was flying in and out of the castle to bring food to her chirping young. More pictures are here and here.